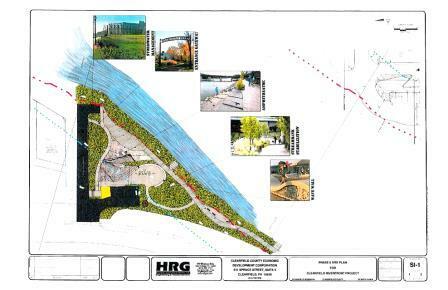 CLEARFIELD – Clearfield Borough Council voted unanimously to give its solicitor permission to draft documents to proceed with plans for the riverfront redevelopment project during Thursday night’s regular meeting. Solicitor F. Cortez “Chip” Bell III will draft an ordinance in order to make Water Street one-way from East Market to East Locust streets. It is also to make East Locust Street one-way from Water to Front streets. Secondly Bell will draft the necessary documents to deed over the right-of-way along Water Street to allow for on-street parking. Lastly, Bell will draft an amendment to the Downtown Business District ordinance. Council noted the borough’s planning committee, code enforcement and zoning officers and the planning commission will solicit the area about what to include in an expansion of the business district, if anything. Clearfield Borough received state grant funding for the riverfront redevelopment project. It retained the Clearfield County Economic Development Corp. (CCEDC) to carry out the project, according to previous GantDaily.com reports. Click here to read a complete story on the concept for the riverfront redevelopment project.